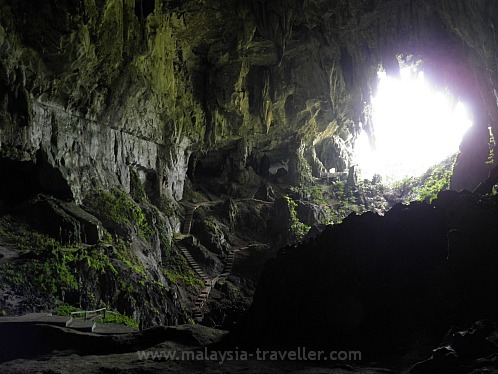 Fairy Cave (also known as Gua Pari) is an impressive show cave near the former gold mining settlement of Bau and about 40km from Kuching, Sarawak. 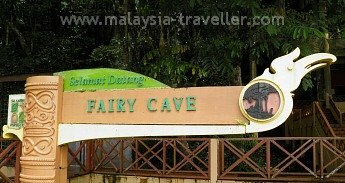 It is just a few minutes drive from another show cave, Wind Cave, and most tourists would combine both on a half-day trip from Kuching. 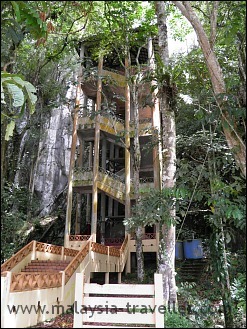 Access to the cave is via a four storey concrete staircase which brings you to the cave entrance. You pass through a dim, narrow passage and up some steep wooden steps. It is fairly dark but you can manage without a torch, unlike Wind Cave where a torch is essential. Some might find this part rather claustrophobic but bear with it as the passage soon emerges into a massive cave with a huge opening which allows the light to flood in. 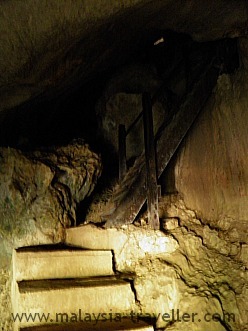 The cave is criss-crossed with concrete footpaths and steps and it is best to stick to the paths for safety and to avoid damaging the fragile eco-system. The combination of light, water and thin, guano-enriched soil allows plants to survive here, mostly ferns. 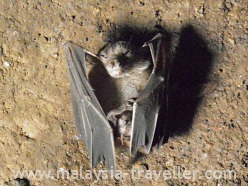 There are a lot of birds (swiftlets) and bats living in the cave, including this small guy who was lying on the path and may have fallen from the cave roof, high above. The mouth of this cave is complete with a uvula-shaped stalactite. 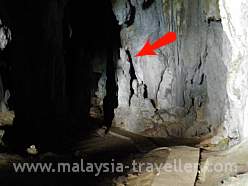 In a shadowy recess of the cave is a stalagmite which looks like a statue of Guan Yin, the Goddess of Mercy. Obviously I am not the only one who sees the resemblance as there were many joss sticks sticking out of cracks in the rocks in front of the 'statue'. 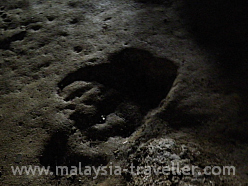 Nearby is a depression in the cave floor shaped like the giant footprint of a yeti or some other huge creature. It seems the fairies in this cave are very large and heavy footed! 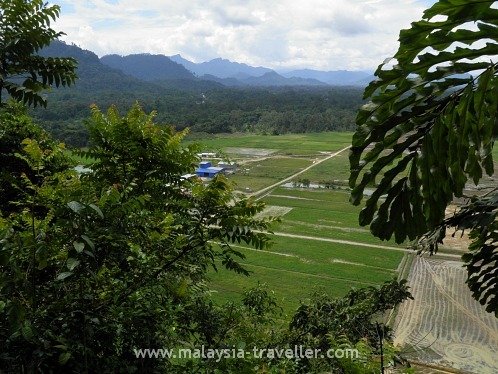 From the opening high up above the cave floor you can get a good view of the surrounding fields and forested hills. The cave is open from 8.30pm to 4.30pm. Personally I think they should charge a nominal fee and use the proceeds to maintain the paths and steps which in places are showing signs of disrepair. 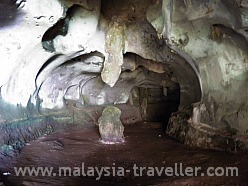 Most tourists arrange a tour from Kuching covering Fairy Caves and Wind Cave. 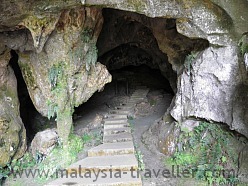 These tours usually last around 4 hours and cost around RM100 per person including lunch. Since I prefer independent travel, I rented a car (RM140 per day) and drove myself. Direction signage on the outskirts of Kuching is not great but once I found the road to Bau (route 1004) it was fairly straightforward. 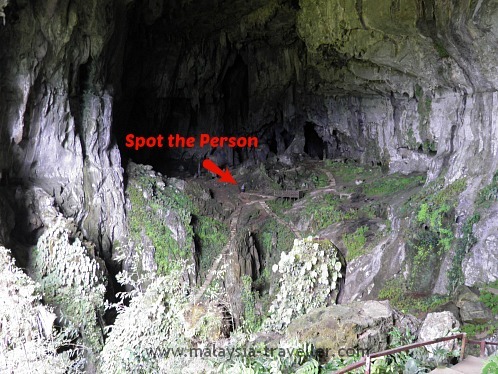 The approximate location of the cave is marked on the map on my Top Sarawak Attractions page. About 8km after Bau keep your eyes peeled for a small sign to Wind Cave. The turn off for Fairy Caves is a few minutes drive after that.